Although I have covered the evolution of digital printing over the past 20 years, I am constantly reminded that established “old-school” printing technologies still have plenty to offer. 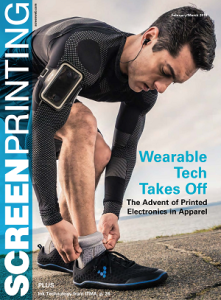 For the February/March 2016 issue of Screen Printing magazine, I wrote about how screen-printing processes are helping manufacturers of textiles and garments develop and test “wearable electronics” that go beyond accessories such as watches and eyeglasses. Designers are suggesting all sorts of ways sensors and transmitters built into wearable garments could improve our health, safety, and well-being. What if technology-infused garments could help doctors reduce hospital stays and improve patient care remotely? What if sensors in infant apparel could help prevent Sudden Infant Death Syndrome? What if your T-shirt could tell the fitness app on your smartphone that you were physically ready to handle more intense workouts? What if bicycling gloves could light up to display turn signals just like a car? What if you could use an app to control how your garment looks? Eventually, we might not need to carry smartphones at all, because our clothing could transmit data directly to electronics and displays printed on wallcoverings and window films or built into our household devices. Essentially our clothing would make us part of the Internet of Things. It’s fun to imagine what might be possible. But in the real world, the commercial potential of these ideas depends on two things: (1) The ability to create durable, washable, and reliable low-power electrical components that can be worn close to the skin comfortably and safely; and (2) The ability to produce smart textiles and clothing at affordable prices. One screen printing expert on the front lines of created printed electronics for wearables is Ray Greenwood. As an independent consultant and contractor, he first got involved with printed electronics in the medical field, developing products such as defibrillator pads for EEG and EKG electrodes. His work has since expanded into developing flexible devices for sports medicine, blood-flow monitoring, and electrochemical electrodes for very specific functions. Companies such as DuPont Microcircuit Materials and Engineered Conductive Materials/Engineering Materials Systems are two companies that have developed stretchable conductive inks that can be screen-printed onto thin, stretchable films that can be protected and applied to garments.